More than 300 aircraft could be seen on RAF Fairford during the 2007 edition of the Royal International Air Tattoo. They all had to leave afterwards which makes the Monday a very busy day, with a lot of aircraft taxiing towards the runway, lining up and taking off. 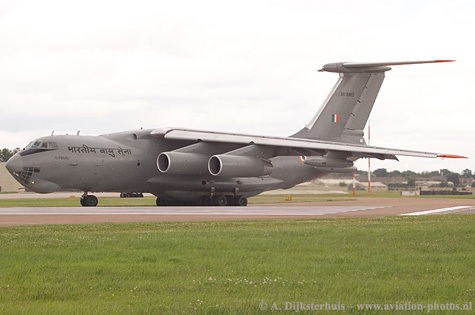 The exodus included rarely seen aircraft like the Indian Air Force Su-30MKIs together with an Il-78 tanker, a Canadian CT-142, an USAF T-1A Jayhawk and a Brazilian Air Force R-99A. On this page you can look at the photographs from the departures on Monday. Another page is dedicated to the airshow on Saturday and Sunday. The weather was not that good, but very good in comparison with the weeks after the event. Two aircraft from the Brazilian Air Force were on static display. 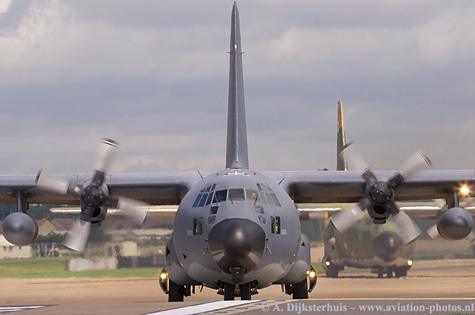 One of them was this C-130H Hercules with serial 2459. It is seen here wearing a nice non-standard color scheme. A unique aircraft on static display was this Brazilian Air Force R-99A with serial 6704 which is seen here ready for departure. 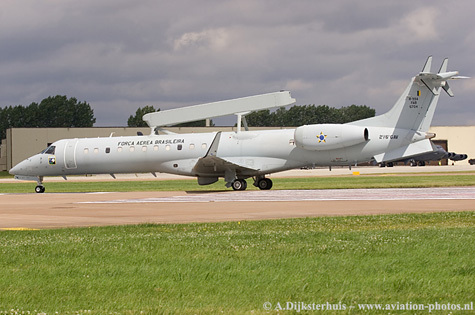 The R-99A is based on the ERJ 145 with an Erieye radar mounted on the fuselage (the Swedish Air Force uses the same radar on their Saab 340s). 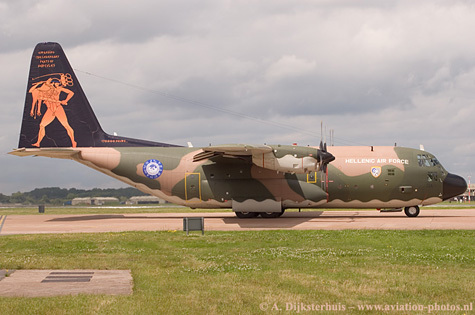 A Hellenic Air Force C-130H Hercules, with serial 752, is seen here with a special tail representing Hercules, celebrating 170.000 hours; 'Expanding the legendary feats of Hercules' was painted on the tail. On Saturday, a hilarious comment was given twice by the female reporter of RIATs own radio station Wings FM; "I am standing here next to an aircraft with a naked man on it". 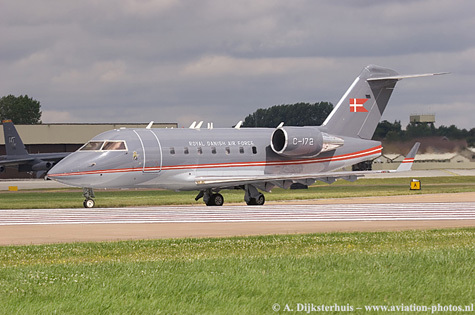 A Royal Danish Air Force CL-604 Challenger, with serial C-172, is seen here entering the runway. The Challenger is operated by Esk 721 based at Aalborg. The Challengers replaced the Gulfstreams and are in use for VIP- flights and Pollution control. 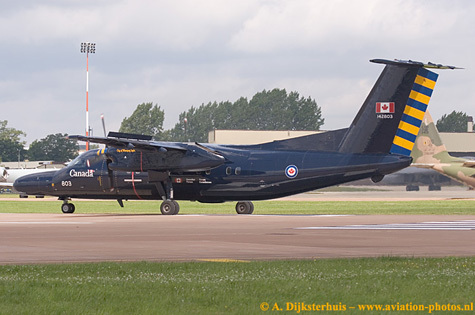 One of the four CT-142 in service with the Canadian Armed Forces was present at RAF Fairford. CT-142 with serial 142803/803, was on static display and is seen here on the runway, ready for take off. The aircraft is operated by 402 Sqn 'City of Winnipeg' to train students in aerial navigation and tactics. The CT-142 is based on the Dash 8. 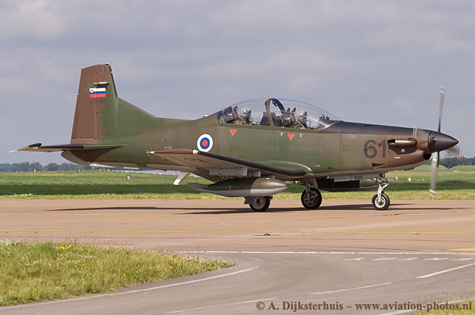 The Slovenian Air Force was again present at RAF Fairford with two Pilatus PC-9M aircraft. A display was flown as well. One of them, PC-9M with serial L9-61/61 is seen here. Another type in the inventory was also present during the weekend; a Let L-410UVP-E which was on static display. 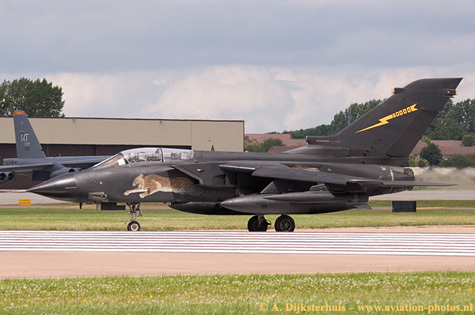 A Tornado IDS from the Italian Air Force is seen here wearing a nice black livery. Two Italian Tornados were on static display. This one, with serial MM7005, and another Tornado IDS in a standard grey livery. Both aircraft are assigned to 36 Stormo. One of the aircraft from the Aeronavale that could be seen at RAF Fairford was this Falcon 10MER with serial 101 and is operated by 57S which is based at Landivisiau. The Rafale M and Super Etendards are also based at Landivisiau. 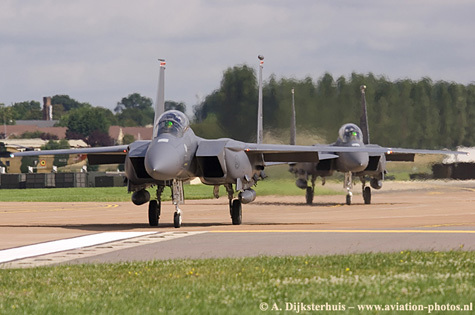 The pilots of these two F-15E Strike Eagles just received their clearance to line up onto the runway. A short flight was planned with RAF Lakenheath being their destination. A display was flown by the East Coast F-15E Demo Team on both days during the weekend. A 'little' longer was the journey for the crew of this T-1A Jayhawk with serial 92-0350/RA. 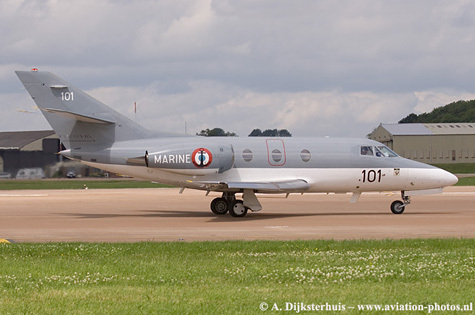 This aircraft is based at Randolph Air Force Base, Texas, and are rarely seen here in Europe. The 12th Flying Training Wing is based at Randolph AFB and is the only unit within the USAF that provides training for both pilot instructor training and combat system officer training. 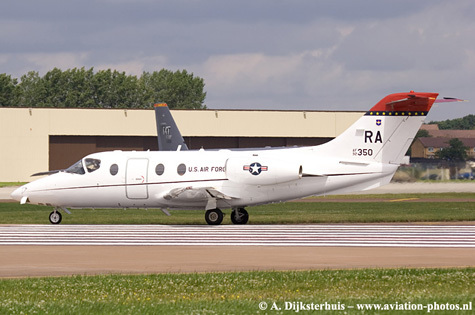 The T-1A Jayhawk is based on the Beech 400A. It is powered by two Pratt & Whitney JT15D-5B turbofan engines, each with 2,900 pounds of thrust. The USAF took delivery of the first T-1A in 1992. 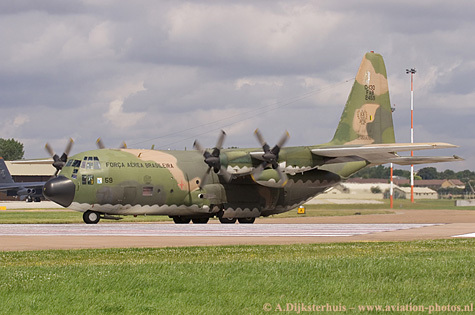 MC-130P Hercules with serial 69-5826 is seen here taxiing towards the runway. This AFSOC Hercules is based at RAF Mildenhall and is assigned to the 352nd Special Operations Group, 67th SOS (Special Operations Squadron). Note the Brazilian Air Force Hercules in the background. Last but not least was the participation of the Indian Air Force with two Su-30MKIs and an Il-78MKI tanker on static display. A third Su-30MKI made a short appearance on the Saturday, but was not allowed to fly a display. 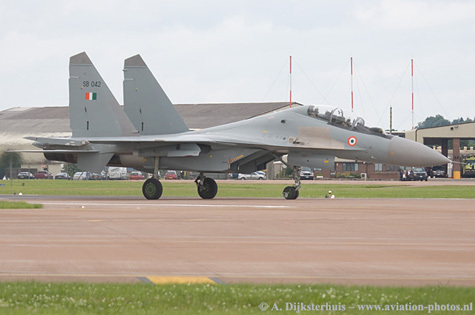 The Indians just finished their deployment with six Sukhoi Su-30MKI fighters to RAF Waddington where an exercise named 'Indra Danush' was held between 2 and 12 July. Three Su-30MKI fighters and one Il-78MKI tanker stayed a little bit longer in the UK for the Royal International Air Tattoo.